GRAHAM FARISH :- PRINCESS CORONATION CLASS 46226'DUTCHESS OF NORFOLK. GF CAT No :- 372-186. Brand New & Boxed Fully. More GRAHAM FARISH Locomotives available. Detailed scale model recommended Ages 14 +. Or come and see us in our shop. Mech Models, Unit 9 Lancaster Park, Newborough Road, Needwood, Burton on Trent, Staffordshire, DE13 9PD. 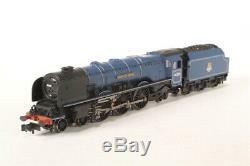 The item "GRAHAM FARISH 372-186 PRINCESS CORONATION CLASS 46226'DUCHESS OF NORFOLK BR" is in sale since Thursday, March 21, 2019. This item is in the category "Collectables\Model Railways & Trains\N Gauge\Locomotives". 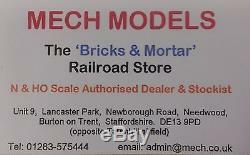 The seller is "mech_models" and is located in Burton On Trent, Staffordshire. This item can be shipped to United Kingdom, Antigua and barbuda, Austria, Belgium, Bulgaria, Croatia, Cyprus, Czech republic, Denmark, Estonia, Finland, France, Germany, Greece, Hungary, Ireland, Italy, Latvia, Lithuania, Luxembourg, Malta, Netherlands, Poland, Portugal, Romania, Slovakia, Slovenia, Spain, Sweden, Australia, United States, Canada, Brazil, Japan, New Zealand, China, Israel, Hong Kong, Norway, Indonesia, Malaysia, Mexico, Singapore, South Korea, Switzerland, Taiwan, Thailand, Bangladesh, Belize, Bermuda, Bolivia, Barbados, Brunei darussalam, Cayman islands, Dominica, Ecuador, Egypt, Guernsey, Gibraltar, Guadeloupe, Grenada, French guiana, Iceland, Jersey, Jordan, Cambodia, Saint kitts and nevis, Saint lucia, Liechtenstein, Sri lanka, Macao, Monaco, Maldives, Montserrat, Martinique, Nicaragua, Oman, Pakistan, Peru, Paraguay, Reunion, Turks and caicos islands, Aruba, Saudi arabia, South africa, United arab emirates, Ukraine, Chile.